Two of our members are in the process of fitting VW Polo heaters into their 2B's. Tony Hurst, who previously had the Mini heater fitted, but found that it wasn't really up to it, so decided to remove that, and fit the Polo heater instead. The heater is fitted the same way up as it is in the VW. You can see a large round vent (stuffed with a small green ball at the moment!) there is another one on the other side, Tony intends to fit directional vents, that will blow air into the footwell. The oblong vent on the top, originally vented air to the windscreen, Tony is hoping to incorporate something flexible that will be attached to the vent pipework on his bonnet, and will come down onto the heater vent opening then sealing when the bonnet is closed, something like the rubber gaiter shown. As you can see, the heater sits nicely behind the centre of the dashboard. On the otherhand, Ian Hale has tackled it another way. Firstly, he has blanked off the 2 large round holes that Tony is using, then he has sawn off the vent that is the "to floor" one in the VW, but left a boss of about 1". Then by using plastic "sink drain" piping from the local B&Q, firstly cutting a square hole in it to fit over the boss, you finish up with a nice round opening at either end that is easy to couple up to the screen vents. Note: Ian has also put 2 screws through into the "Flap" body, to act as a stop on the "Flap"
This view shows the same size of "sink drain pipe" already fitted to what was once the top vent of the heater by the same method as previous, in fact you can just see the 2 tie wraps holding it. Also, because this vent will now become the "Floor" vent, Ian has fitted a pair of drain elbows, 1 on each end, that can be angled wherever is required. Nearly ready for fitting into the car. You can see the 2 round vents blocked up, and bottom vents with the elbows fitted, to keep you footsies nice and warm, with the screen vents able to be coupled easily to the top tube. This shows it in position. You will note that it is the other way up from the way that Tony is fitting his. This heater has a water valve that switches the heat on or off, 3 speeds, and an up, down, and front vents position on the "Flap" the blower is very powerful, and any permutation will work very well. I myself have one of these heaters in my Mark 3, and can if I need to, drive with lovely warm legs even in the winter, without the hood on the car. They are a really good heater, and can be recommended. These are a couple of photo's of when I fitted the Polo heater. I did the same as Ian with the "sink drain pipe" and mounted the heater "upside down" into the firewall by using the flange on the unit itself. Control of the flap & water on/off are by 2 "hard wire" choke cables. a 3 way switch for the fan speeds. A number of people seem to have difficulty in wiring the heater up, so these are the connection and what they do. 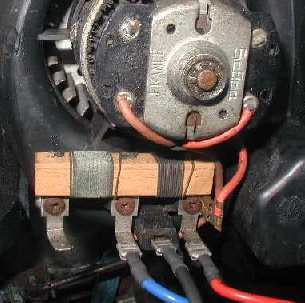 It's a good idea to check the heater when you've taken it out of the Polo to see that the various speeds work, as the resistor wire that is lapped around the block can corrode & fail, making either the 1st, or 1st & 2nd speed inoperative. you can see 3 connectors coming from the block (we are only using 2 on this application) The connector on the far right, (with the red wire to) is the "full speed" or 3rd speed, this is wired directly to the motor, so if the fan won't work if this is connected, the thing is U/S. the middle connector, (with the blue wire on) is the 2nd speed, and the one on the left (not connected) is the "slow" speed.